This picture was one that brings brotherhood full circle. Plus I took it with a camera phone. Bro. Francis Hall (Alpha 1935) asked me to bring the new Alpha Chapter line (Spr. 2005 – 70 year lifeline) to see him. Well the young brothers honored his request. This picture was taken in April 2005. Bro. Hall had a great time with the brothers. One of the last thing he asked me to do was to bring them back to see him, and they did. 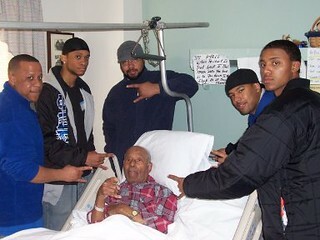 The last time, we visited him I was with the Epsilon Psi Chapter from the University of Maryland (December 18, 2005). Bro. 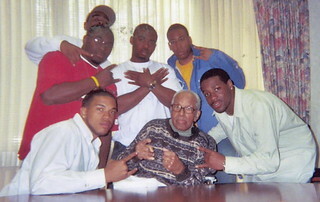 Hall joined the Omega Chapter, January 20, 2006. A TRUE SIGMA LIGHT IN EVERY RESPECT.